Listen to Episode 337 now! 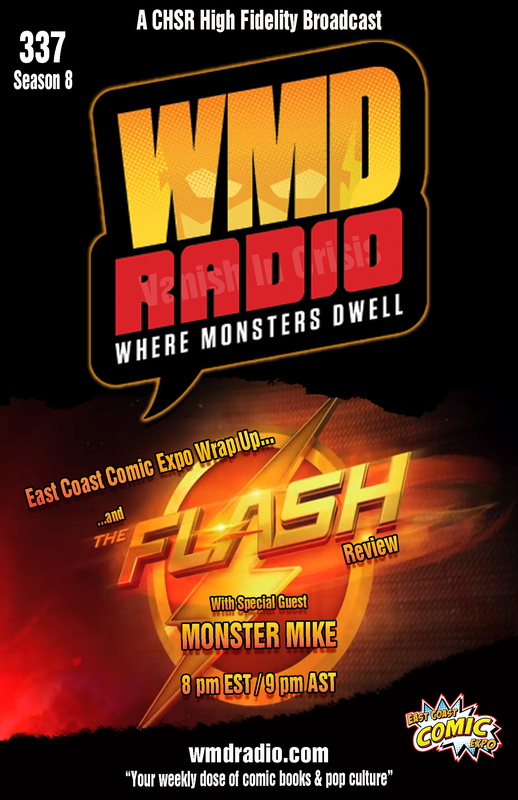 This week on Where Monsters Dwell we’ll be talking to Redshirt Ryan all about his East Coast Comic Expo adventures AND we’ll be joined by special guest and Superpub co-creator Monster Mike! We’ll also be talking about the Flash season finale, new comics and more so don’t miss this week’s episode, Wednesday at 9PM AST / 8PM EST! Listen to Episode 336 now! 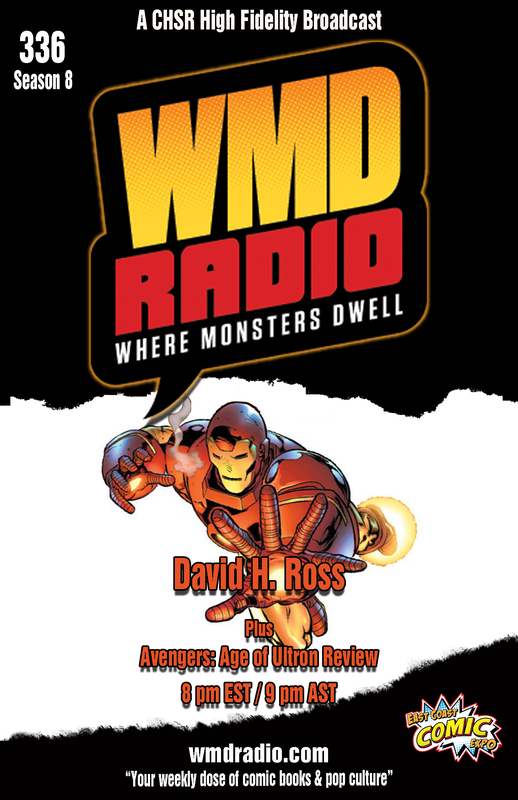 This week we’ll be talking to illustrator David H. Ross about his work and his upcoming appearance at East Coast Comic Expo (ECCE) on May 16th in Moncton. Be sure to tune in Wednesday at 8PM EST / 9PM AST! As always, we welcome your participation in the show. Join us in our chatroom, post to our Facebook page, tweet us, or call us at 506-452-6056. Listen to Episode 335 now! 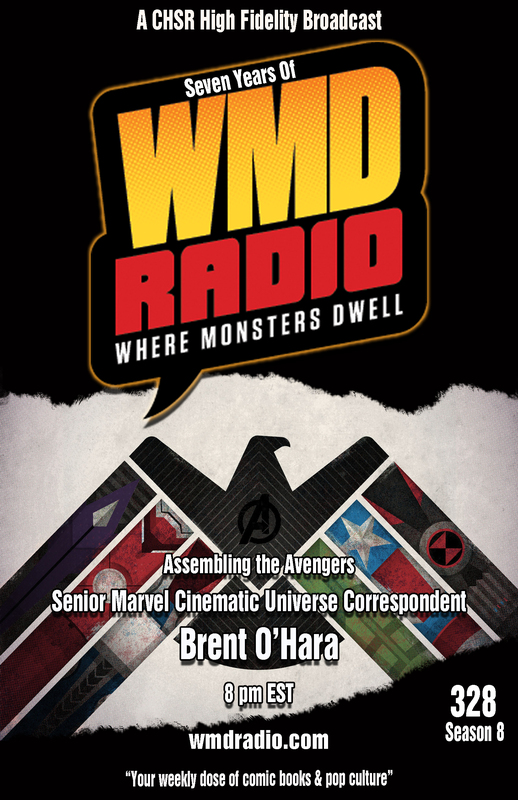 This week we welcome back Senior Marvel Cinematic Universe Correspondent, Brent O’Hara, to the show! He’ll be joining us to talk about this week’s highly anticipated and much talked-about “Avengers: Age of Ultron” premiere, maybe a little Daredevil, and of course, next month’s East Coast Comic Expo in Moncton, New Brunswick. And if that’s not enough – Saturday is FREE COMIC BOOK DAY! The one day a year where you can walk into your local comic shop and leave with a handful of FREE COMICS! Age of Ultron?! Free comics?! Well, there’s more! 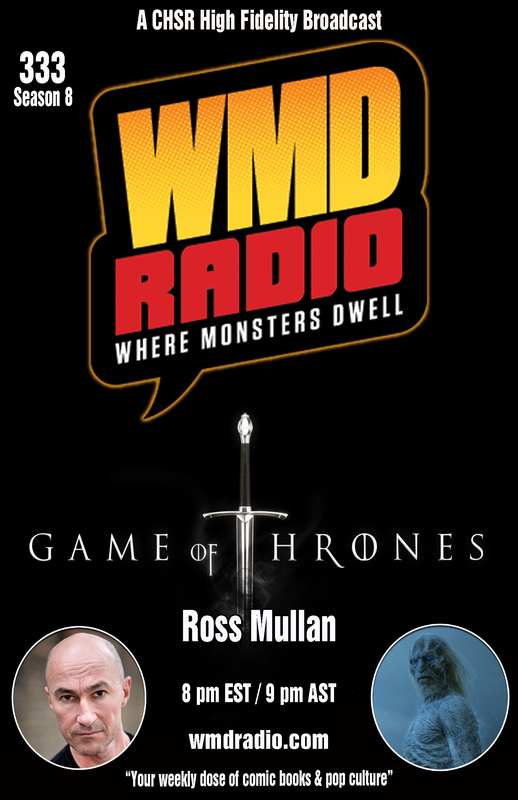 We’ll also be giving away our huge Game of Thrones prize pack live on the show. There’s still time to enter if you haven’t already. Go to our contest page and read all about it. Listen to Episode 334 now! Listen to Episode 333 now! 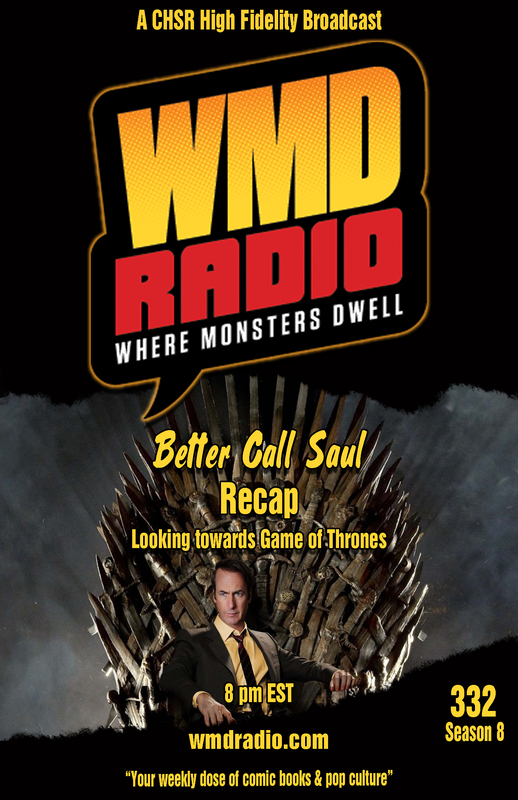 This week it’s back to Westeros for the long-awaited return of HBO’s Game of Thrones! Winter may be finally leaving the East Coast, but it’s still looming over Seven Kingdoms. And what about those White Walkers and their army of the dead advancing on the Wall? We asked the White Walker himself that very question when we sat down with him at Halcon a few months ago. You definitely won’t want to miss our interview with Ross Mullan at the top of the show! And are we ALREADY deviating from the books? Yup. They said it would happen and they didn’t wait long to start bringing forth the change. Be sure to stick around after new comics for our breakdown of the first episode of Season 5. Have you entered our Game of Thrones contest yet? Only two weeks to go before we give away a great prize! Check out our contest page here for full details on how to enter. Listen to Episode 332 now! Listen to Episode 331 now! This week on WMD Radio we are joined by the one and only Theodus Crane, also known as “Big Tiny” on Season 3 of AMC’s The Walking Dead! Together, we’ll be recapping the series, talking about his experience on and off the set and what he’s been up to since his time on the show. We’ll also check in with Jay at Strange Adventures for the latest books to hit the shelves at your LCS on April 1st – AND a huge thanks to Jay for Episode 331’s poster! Finally, our “Game of Thrones Prize Pack” contest is in full swing all through the month of April. Check out our contest page for details on how this great prize can be yours! Listen to Episode 330 now! 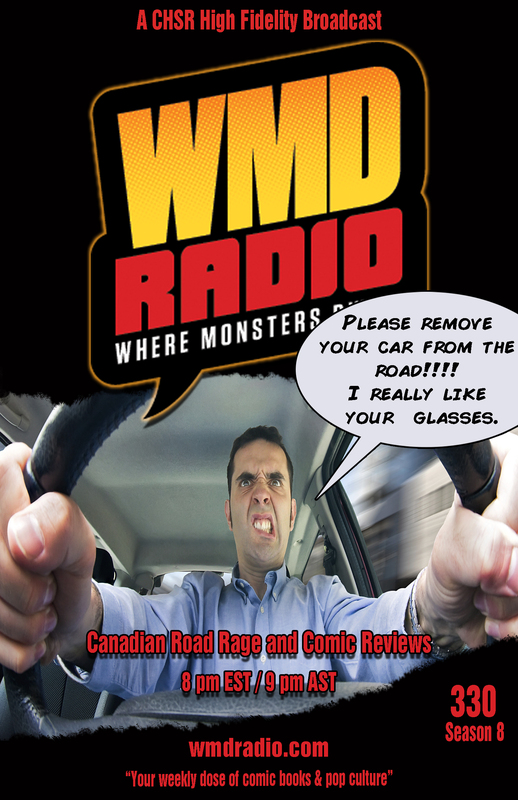 This week on WMD Radio we’ll be talking about a little thing we do differently north of the 49th parallel: “Canadian Road Rage”. Pop culture comes in many shapes and sizes, folks – and viral videos come from anywhere everywhere, so WMD Radio’s back yard is no exception. We’ll break down this local and courteous exchange of driver discontent while throwing in our usual 2 cents. And after 2 weeks of recklessly leaving Brew and Redshirt unattended in the studio Remy is back! We’ll catch up with him while we review a few comics from our LCS, follow up on a couple of your favorite shows – heck, we might even have some stuff to give away again! All of that plus a BIG guest announcement for next week’s Walking Dead series recap episode! Listen to Episode 329 now! Want to share your thoughts? We welcome your participation in the show. 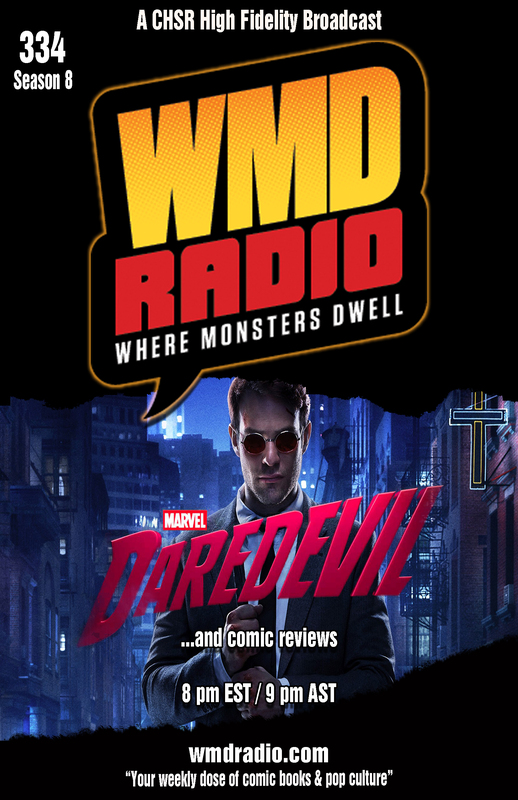 Post questions or comments in our Facebook group, join the discussion in our chat room: www.mixlr.com/wmdradio, or tweet us @WMDRadio. Listen to Episode 328 now! 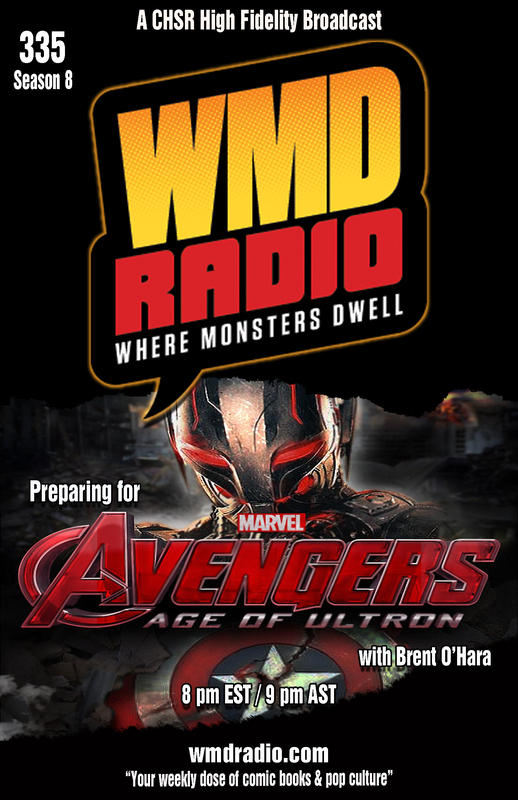 The third official Avengers: Age of Ultron trailer has been released and we’re welcoming back Senior Marvel Cinematic Universe Correspondent, Brent O’Hara to help us break it down. We’ll also be asking him for the latest news on East Coast Comics Expo. Tune in for new comics, “Harrison Ford and the Terrible, Horrible, No Good, Very Bad Day” and a glance back at 7 years of WMD. Season 8 premieres Wednesday at 8PM EST/ 9PM AST. Listen and join the discussion in our chat room here: www.mixlr.com/wmdradio. 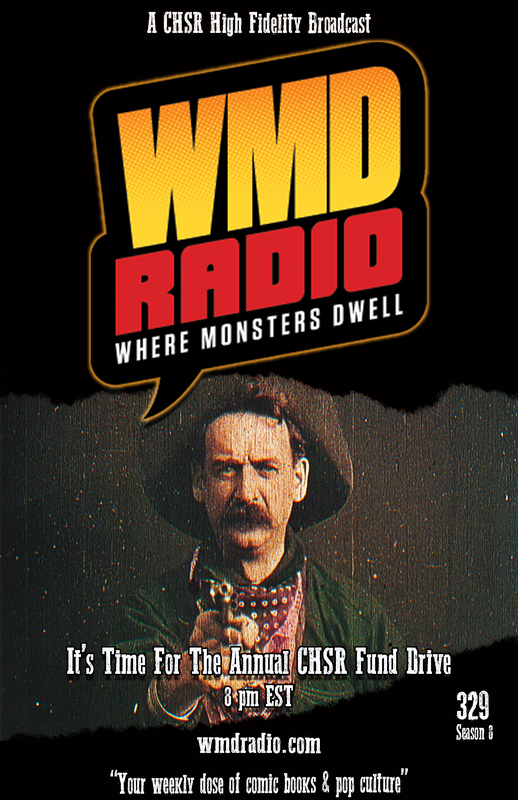 Follow us on Twitter @WMDRadio. Listen to episode 327 now! 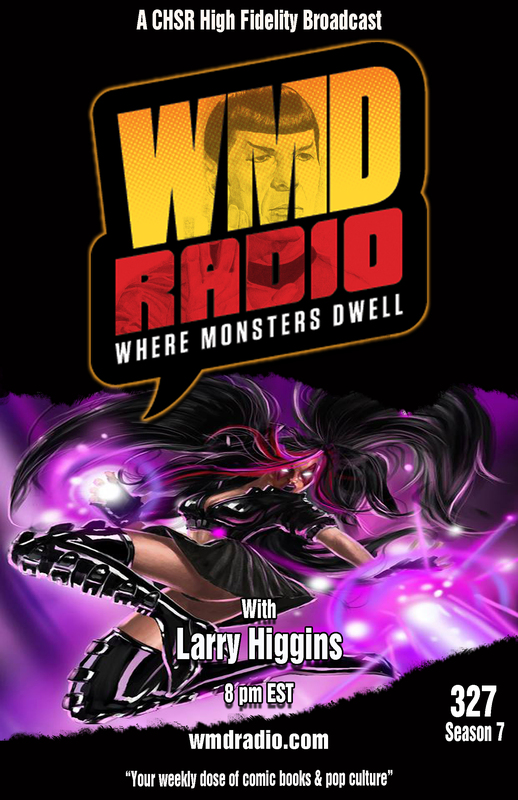 This week on WMD Radio we welcome another local comic creator to the show, Larry Higgins. Larry is the creator of, “Nyobi”, and he’s going to stopping by to tell us all the ups and down of trying to self publish a comic. I’m sure there is more “ups” than “downs”. There has to be! Also, pop culture lost another legend; Leonard Nimoy died this past Friday. 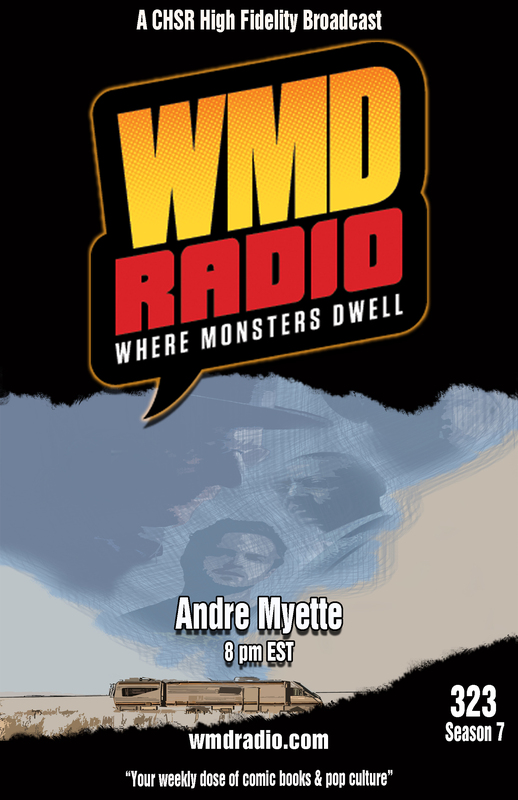 Tune in as we’re joined by Monster Mike to say farewell to him. Listen to Episode 326 now! 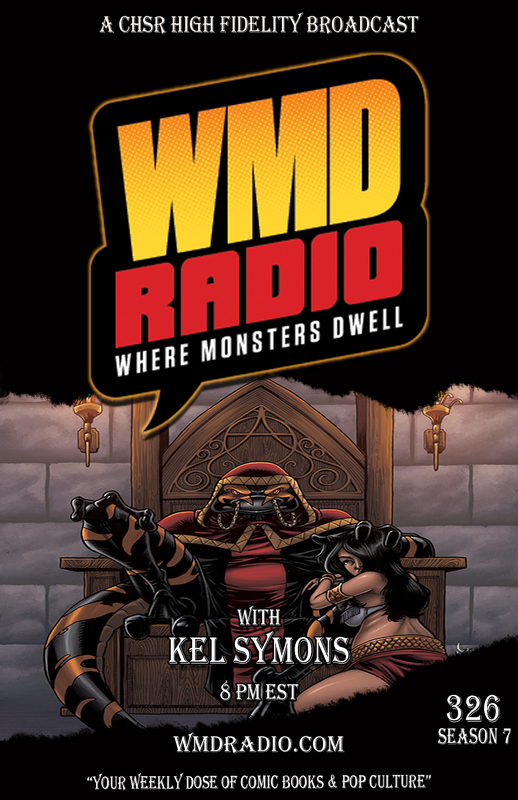 This week on WMD Radio we welcome back Kel Symons. You’ll remember Kel’s work on “I Love Trouble”, and “The Mercenary Sea”, both from Image Comics. Kel is back with a brand new book, also from Image Comics, called “REYN”. What is Reyn you ask? You’ll have to tune in this week at 8 pm EST (9PM AST) to find out. Hope you can make, it! 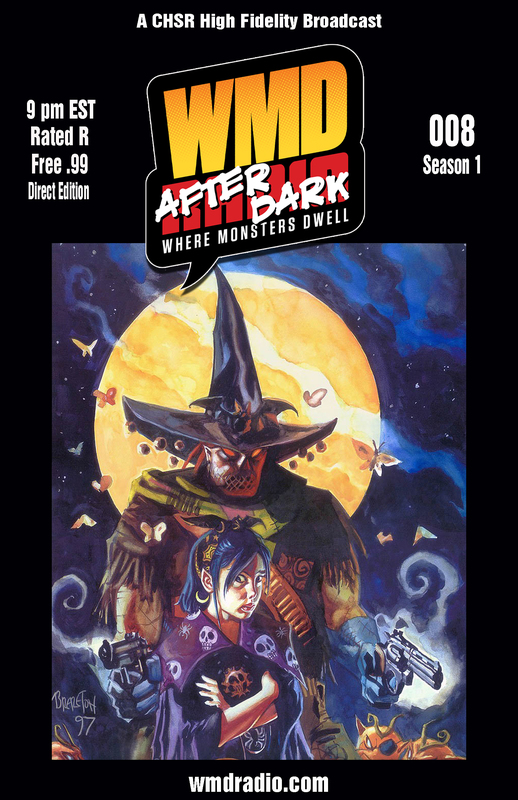 WMD Radio is sponsored by Club Fred Grafx and Strange Adventures and we get our pop culture news from SciFi Mafia. Listen to Episode 325 now! Fifty Shades of Grey is a terrible movie and should not be seen by human eyes. 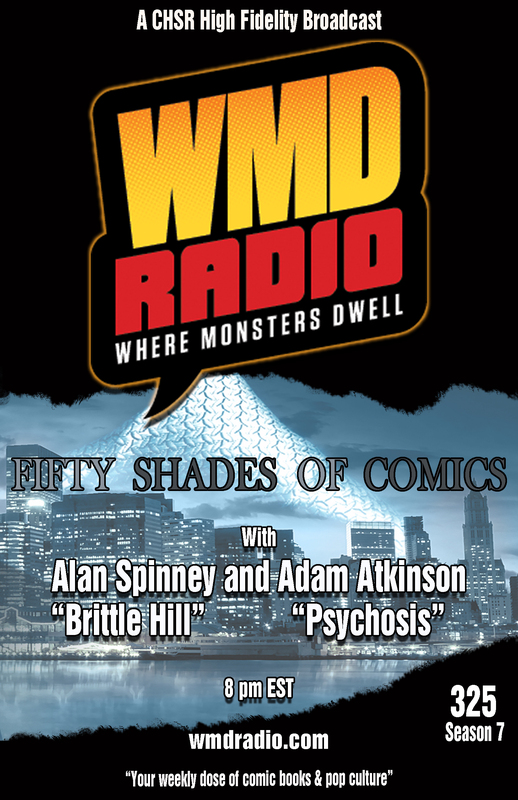 This week on WMD Radio we welcome two local comic creators to the show. Alan Spinney who is the co-creator and artist of “Brittle Hill”, and Adam Atkinson, co-creator and writer of “Psychosis”. Both live in the Moncton area, and they’ll be with us live to talk about their books. 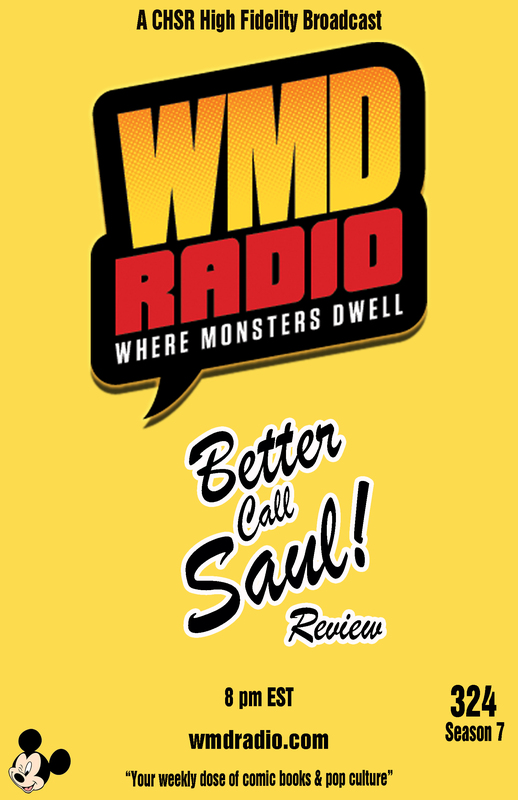 WMD Radio Episodes 323: André Myette & 324: Better Call Saul!…Review! Listen to Episode 323 now! Listen to Episode 324 now! Listen to Episode 008 now! This week our favorite American joins us from the wilds of Minnesota to partake in the usual rapid-fire shenanigans we call WMD After Dark. 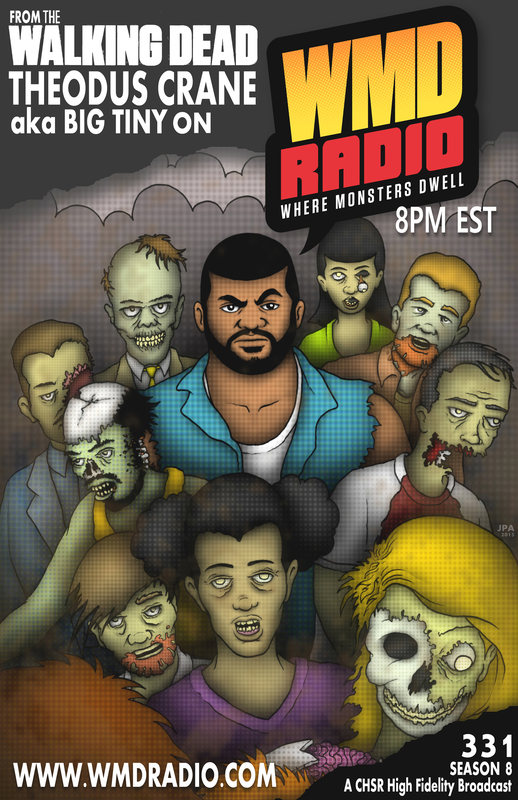 Join us at 9PM EST/10PM AST as Ryan Lee shares his views along with our panel and *maybe* drops a few sublte plugs about his webcomic collaboration with Monster Mike called “Superpub”. Grab a coffee, add some alcohol and be sure tune in! In the meantime, you should really go check out http://www.superpubcomic.com/!